Ah, interesting. Well I'm afraid I don't have experience with the noise floor as it's being described. When I think "Noise Floor" I think of background/ambient noise, and how listening late at night is better in that regard because there's less "white" noise coming from outside, cars going down the street, etc. It's all about lowering the noise floor, which is something one doesn't notice until it is lowered. It's possible Bud's system is just really THAT much more revealing, and thus the little things like isolation feet start to add up and make a difference. It's mentally difficult to wrap my head around THAT nice of a system. Don't ever say that again please. You can hear a difference... everyone can. If your system was at his level those details can greatly alter the sound. You would be intimately familiar with the sound and pick up on it quickly. I'm not being mean but that type of thinking is deadly to growth in this hobby. It represents a closed mind in a way. I don't think your system is far off if at all from showing those kinds of changes. The key is a solid cable foundation and treated room. It doesn't even have to be overblown, just focus on first reflections first. Those are the two areas that made subtle differences blow into big ones in my own system. I hesitate doing too many room treatments since it's a rental, but I might post up a pic or two and see what people suggest. Even though it'll be embarrassing how lame my speakers have to be positioned. I think the room might actually be slightly overdamped currently, but that's just my uneducated opinion. And yeah maybe if I get a VTI rack I'll notice an aural improvement straight away with no other tweaks...?! Tons of ideas around the net, forums, pinterest, etc. Some panels and command strips can go a long ways. That's what I do at shows. It's damage free and easy to install. 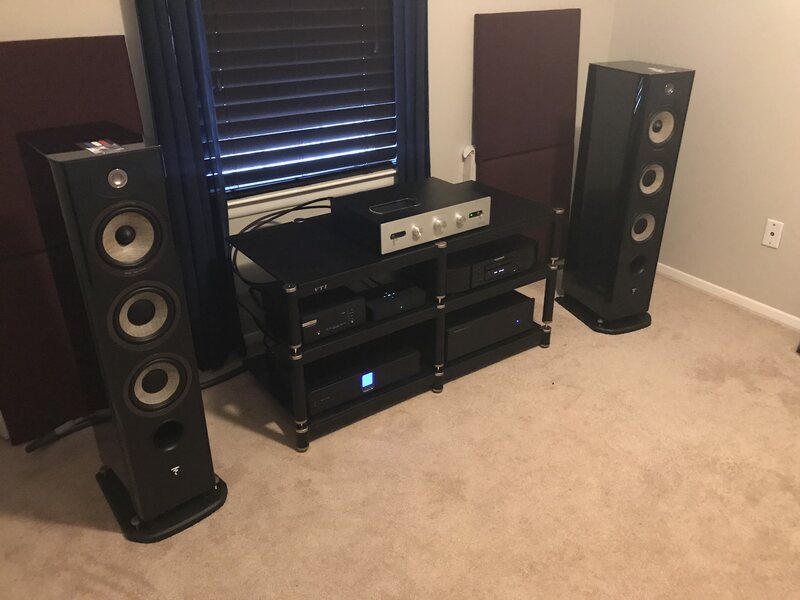 When I first realized the benefits of clean power, and vibration elimination, I was using Cambridge Audio pre and amps, Wadia iTransport for iPod, and a Bryston DAC. All this on a flimsy home entertainment center. I was amazed at the improvement every time I upgraded a power cable, conditioner, a brass footer. The gear I have now is based on that foundation. Also, at that time I was using a shared circuit that the whole left side of the house used. Thanks for the insight. You might have better ears than I do. I don't know if I'd be able to discern/detect a sound wave's vibration/impact on the equipment and the associated negative sound quality. The vibrations on the equipment rack, and on the equipment, come from the speaker sound waves hitting them. Gear is susceptible to the tiniest vibrations, and those vibrations alter the sound. That is why in addition to having a solid, vibration resistant rack, the gear should also be on some type of vibration draining footer. I use Mapleshade Micropoint Brass footers, but there are other vendors and types. You don't know what you don't know, as the saying goes. I had to take myself out of the mindset of "most of that stuff is bull, and, wouldn't matter on my meager system" and actually try some stuff id just ignored because it was easier than having to spend money on something that "probably won't make a difference anyway." I started room treatments with acoustic foam purchased from Walmart online and placed on the wall with painters tape. Easy, removable and enlightening. Spot on here. Most don't know they even have an abundance of it, until it's gone and the results are eye opening. Because most don't realize they even have noise, they fail to even pursue cures for it. Which, sometimes your better off being blinded, your wallet may appreciate that fact. Nice racks btw, wish someone could make a reasonable one though that doesn't cost used car kinda money and looks nice. Coming your way, its from CL South Bend. FYI--Timber Nation will do custom work including just slabs. He would do slaps with pre-drilled holes if you wanted to do a DIY Maple Shades stand, just tell him what you want. He'll also put the custom stains. 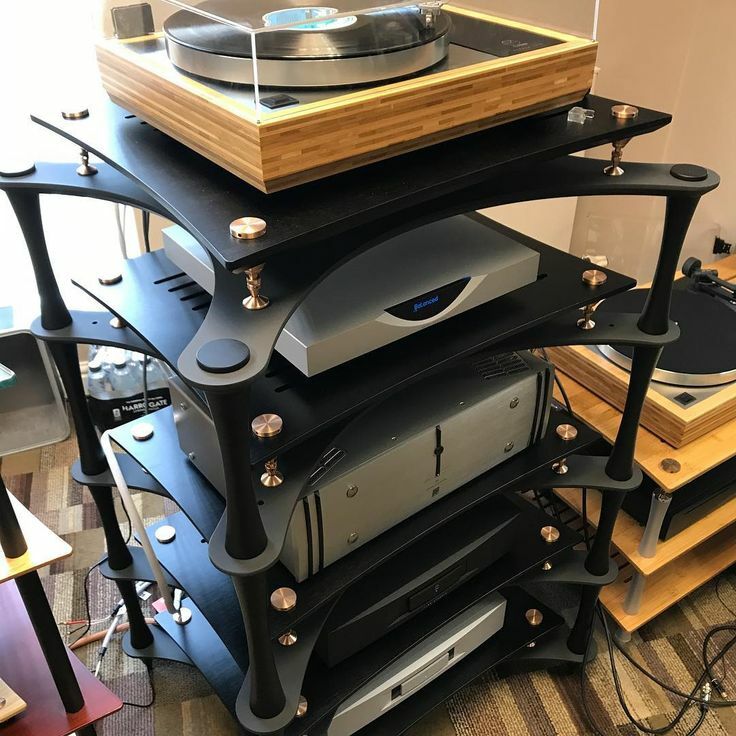 Here's an expensive rack that I think is cool. I actually misses out a chance to purchase one of their entry racks for a couple of hundred. I like the vented banboo shelves. Going to contact Mapleshade tomorrow and see if I can order the gold/brass nuts, washers and cap nuts. I kind of like that idea. Could probably drill them out myself with a good Forstner bit. I can handle the stain part as well. Been looking, off and on, past year or two for the hardware like Mapleshade uses, but, I haven't found it, or anything like it. Oh hell yes! Those vented bamboo shelves are perfect! I'll reel this back in a bit with Salamander Designs racks which are a little more budget-friendly, and still fully adjustable and customizable. 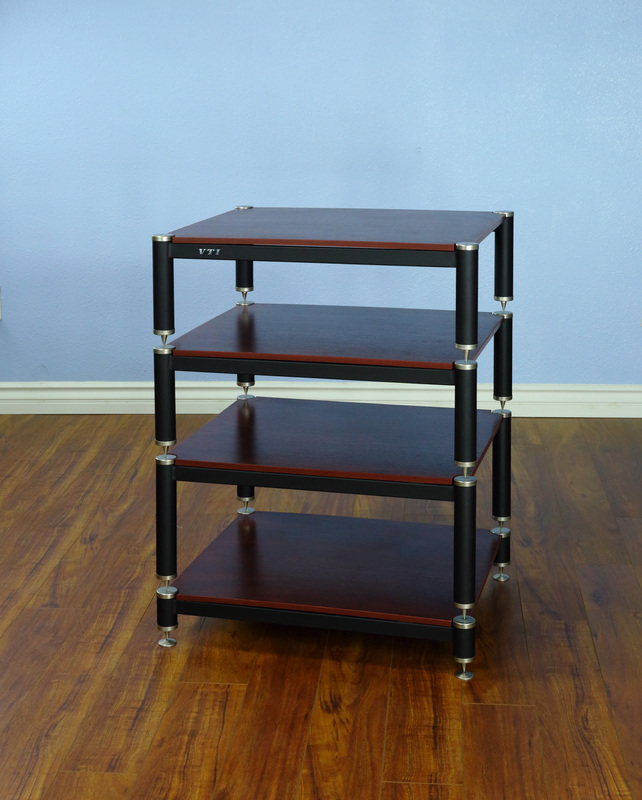 https://www.salamanderdesigns.com/modular-open-stands/ I picked-up a used one on CL for storing bullpen components. For strictly turntable setup, I have one of these from Turntable Lab. 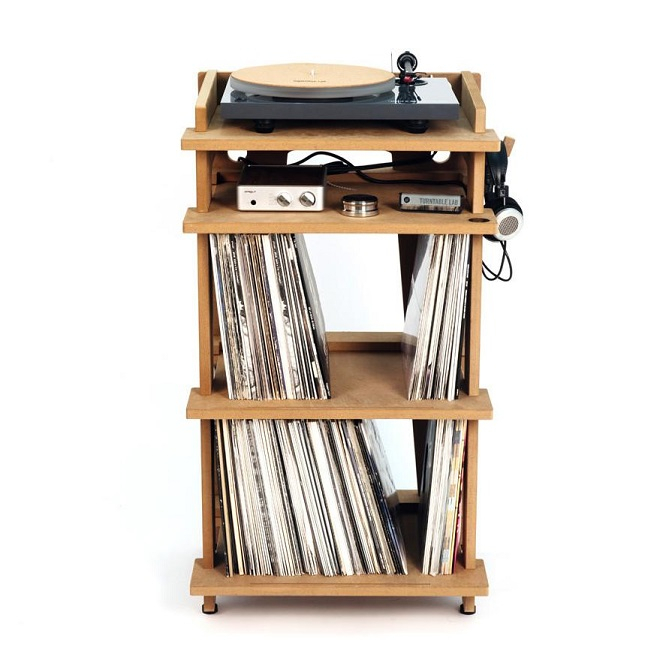 https://www.turntablelab.com/collections/turntable-listening-packages-alpha/products/line-phono-turntable-station These are quite solid and heavy, especially once weighted-down with a couple hundred records. I can actually move records in-and-out of the shelves with a record playing without any skipping. 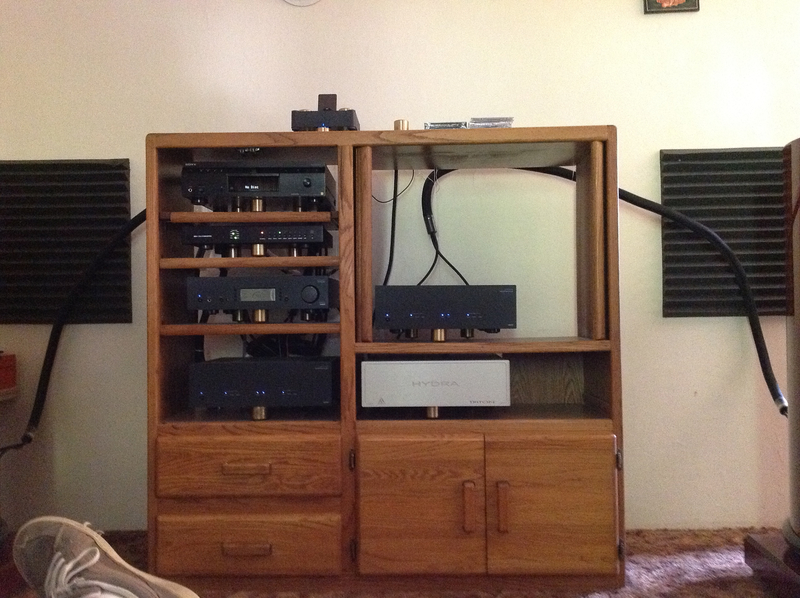 I built speaker stands using the same interlocking slots as that bottom rack. My stands tilted the speakers backward a little bit. And there was no glue or nails or screws. They were super strong and rigid too. Everybody liked them. They were kind-of hobo artsy. And I could take them apart and lay em flat. I used 1/4" Birch plywood though. I might still have them but I doubt it. Nice. I remember when TTL first introduced that stand. Pretty nice piece, but a lot of people were complaining about the price and that it's MDF. I'm pretty much sold on this VTI BL404SC rack at this point, with an additional 7" shelf added. Seems like it's a decent combination of looks, performance, and low price. VTI is an industry standard due to decent build quality, modular design, and price point. For a first rack, you really can't go wrong. Heck, for many, its the last rack they buy. On a personal note, I really like the Quadraspire racks as well. I've considered many times picking them up, but even with dealer pricing its quite a shock to the wallet. I've looked at other options but I think Quadraspire offers a pretty solid offering from top to bottom with a good variety of designs to suit most people. 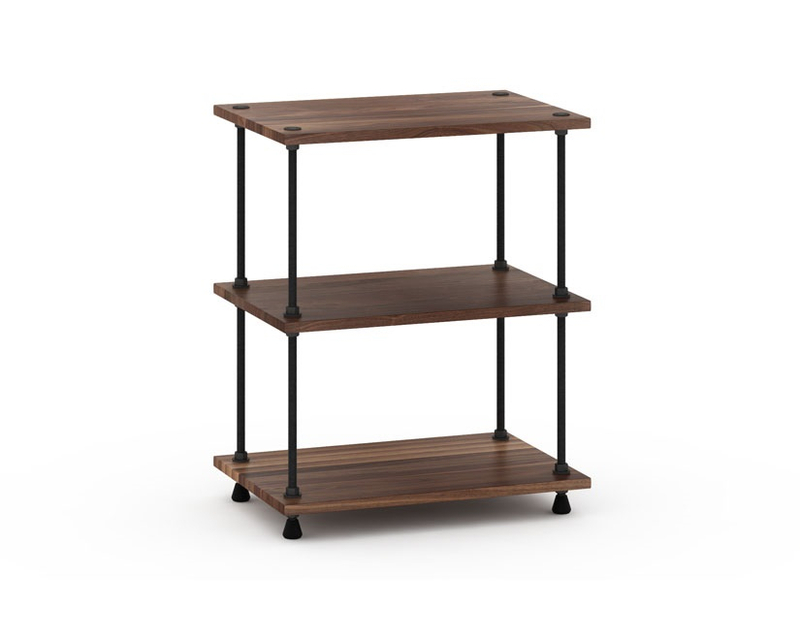 I bought a VTI with glass shelving. Loved the look but the glass ringed so a cut 3/4" mdf shelving to put under the glass. Filled the posts with sand. All good now! Went with the VTI BL404SC I posted above. Seemed to be the best price to performance ratio, it also looks damn good, IMO. Thanks to @helipilotdoug for the deal. Anyone looking for a VTI rack should hit up Douglas Connection. Pretty excited that I'll have a proper equipment rack soon! I have one. Someday when I have extra cash I’ll spring for a new rack, but the vti has been so dependable, you’d have to spend a lot more to get significant gains. Thank you Drew Looks like your rack and extra shelf will be delivered tomorrow. Fun weekend ahead for you! What do think of BDI? Are they quality pieces? I’m looking for something around 48 inches wide. Am i imagining something, but was there a rack pic on this thread (hint-bikini clad)? Was it removed? Yep, @Rick88 posted up some jugs that he couldn't afford, but now it's gone. Nice. Nice man, sweet, clean looking set-up. How's those Focals breaking in for ya ? My bad. I posted the unedited version. Here's the racks I like best.